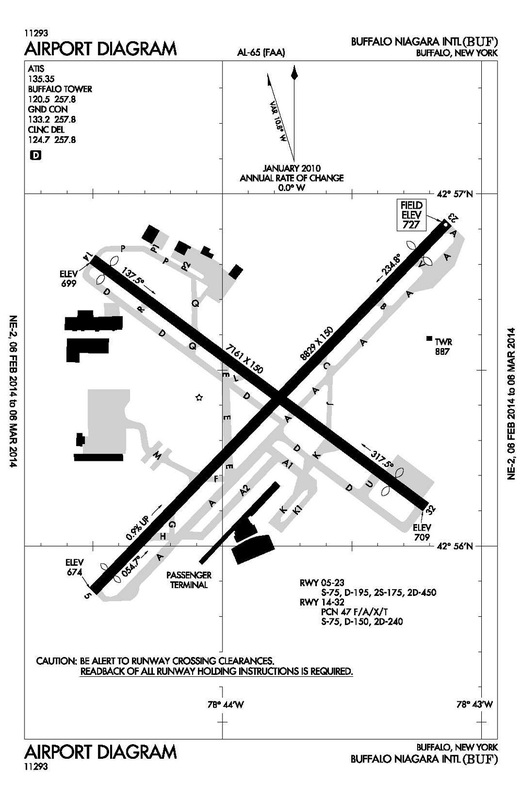 Buffalo Niagara International Airport is the main commercial airport serving the Buffalo area. Measuring 1,000 acres, this is the third busiest commercial airport in New York, behind only JFK and La Guardia. The airport dates back to 1926, and was a prominent part of the earliest U.S. airmail flight routes. There are 37 civilian aircraft based here, including seventeen single-engine props, five multi-engine props, thirteen jets, and two helicopters. ATC services are provided 24/7 by FAA controllers. In 2012, the tower averaged 340 operations per day (thus, seven takeoffs per ATC-hour, or roughly eight minutes between takeoffs, on average). Annual operations peaked at 165,000 in 2000, but have since declined by 25% to 124,000. One unusual detail about KBUF traffic is that this airport is bucking the national trend toward the reduction and elimination of GA local flights at airports dominated by the airlines. In fact, KBUF has seen a substantial increase in local GA pattern traffic. Ten years ago, the average was 12,000 local pattern operations/year, but in 2012 the average was 31,000 local pattern operations/year. A brand new terminal building with 15 gates was opened in late 1997. This was later expanded to 25 gates. …The money, to finish noise mitigation on 187 impacted homes, was secured through FAA’s Airport Improvement Program. The article notes that Senators Charles Schumer and Kirsten Gillibrand lobbied for the project. …An archived article. Discusses the Part 150 Noise Study process at Buffalo.